If you are looking for a company that really pays you to read emails, you can check out EmailCashPro – a company that rewards you for referring new members to join you and pays you when you read their emails! 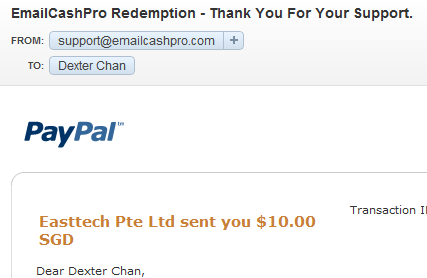 If you are not into PayPal, you can always request for a Cheque to be sent to you as well! What Is This EmailCashPro All About? Those who were still interested in making money online went on to create or tap into other opportunities like online network marketing or affiliate marketing for companies like Amazon.com. As most people went on explore other great opportunities, the guys behind EmailCashPro went on to revive this industry and based on my personal marketing experience, this company has successfully outlasted many of its predecessors. But if you are thinking of making the same kind of money (like $100 every month), it will not be that easy like before but if you can refer a lot of members to this company and at the same time the rate of (new or old) advertisers coming in can sustain it – you can still expect to earn a good pocket money every month. 1. You will definitely need a valid email address to sign up, followed by your Real Name (for the Cheque) and a Paypal Account (payment through that) and lastly a nickname. 2. Express your levels of interest with EmailCashPro and they will send emails to you that match your interests. 3. Click on the Links and you can earn points which will be automatically turned to cash points depending on the company’s monthly exchange rate. 4. To keep the Program sustainable, it’s advisable for you to take part in the Advertisers’ Promotion since it matches your Interest. Most of the Promotions should be quite relevant, e.g. Seminars or a quick shout-out to a time limited Promotion. 5. To propel your earnings potential, you can always blog about your experience with EmailCashPro and have other new members to join you. This will do you good because their participation will help you to clock up more points. And if you are able to refer more than 20 members, EmailCashPro will upgrade you to their ‘Gold’ status which has a $5 add-on bonus to your account. 6. Once you hit $10 at the end of the month, reward yourself by redeeming it as a Cheque or through Paypal. Admin Fees do apply so it’s best to take note.